It must be difficult to live with a photographer. First, you must think you’re eternally being spied upon, trying to be caught unawares, that an eye waiting to catch the true-true-you is always present, and always watching. It is only later that you realize that it isn’t your essence that the photographer is trying to capture and distill truth from, it’s theirs. That each image pointed at you is really just a sublimated view of themselves, and that what they project when they point and click in your general direction is really just a reflection back of self, sometimes twisted and sometimes upside-down. So it’s a perverse kind of attention: they look at you to get a better look at themselves. Didn’t you know that an essential piece of the camera is the mirror installed inside the casing? Are all photographs made by photographers of those they love just a kind of extended visual autobiography? How much does our conception of the world hinge on how we love? Does the dynamic of our chosen relationship(s) begin to define our aesthetic, at least in relation to how we visualize it? And how do we choose partners? Do we choose one that keeps us in check by having a world view that complements (does not mean that it is the same as ours) our own? Do we choose one that will tear ours down, or constantly challenge it? Or do we choose one that we can only grasp for a little while, knowing that love and life (and photography, too) are ephemeral and fleeting? I’ve been thinking about photographers in love, and the photographs they make while in that state. And also its shadow-twin: same photographer, making something out of a place of loss from that love. What is it to make a memory out of loss? To distill the precise ache of mourning? In photographs that become about loss‚ did the losing already happen before the photo? Did it happen in the course of it? Is the photo then a document of loss? Are these then the most documentary of all documentary images? 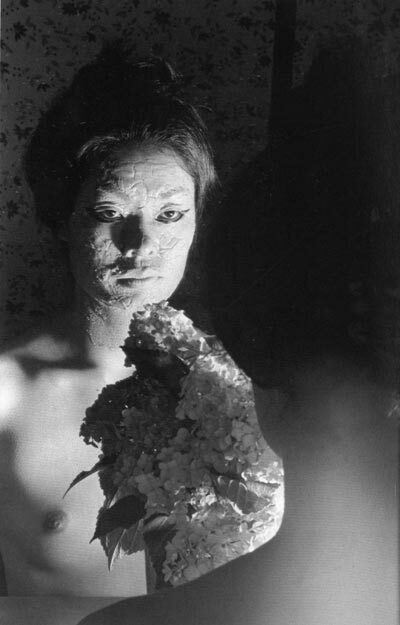 The body of photographs I’ve seen of Yoko show a multiplicity of moods, filled with both surface and subverted meaning. 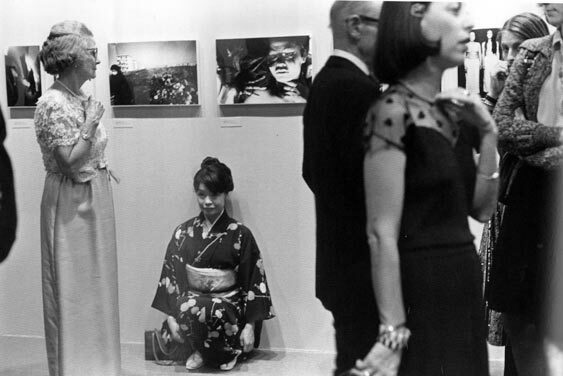 there are playful, joyous photographs, such as the first one above; sardonic commentary concerning perception, as in the second (the photo shows Yoko dressed in formal kimono, kneeling beneath photographs of herself at the opening of John Szarkowski’s curated show at MOMA in 1974 of New Japanese Photography, totally and utterly ignored by the hoi polloi coming to mingle around images made of her by her husband, whom the show, in part, is celebrating); and still there are those posed, Mastubara Apartment, which for all its premeditation, probably says more about power and projection than even Fukase could have imagined when composing it. When I read about Fukase’s fate last week I was stymied. Struck with the realization that a photographer with such clear, articulated and felt vision was prematurely taken, and that whatever else he might have had to say was taken away not only from himself but the rest of the world to experience through him; then the aftershock that it is not the finality of death that has taken that away, but the murkier waters of the mind which has receded his thoughts and inclinations from both himself and anyone else. Fukase has no clue who the Fukase was before that made those photographs, or why, or what can be gained in the making. He has no care that an entire lifetime happened before he is where he is now; and further, given how tortured he was over the loss of Yoko (even despite the remarriage he reportedly never stopped mourning her), the now obliviated mind might be a kind of gift, a reprieve from too much knowing, too much sight.